The Asia Cruise Forum JEJU enters its fifth year in 2017, thanks to the support of all related personnel from various fields around the world. Since its inception in 2013, the Forum has endeavored to bring the cruise market together, emphasizing knowledge exchange, partnership, and networking. Held over four days from Aug. 24 (Thu) to Aug. 27 (Sun) at the International Convention Center Jeju (ICC Jeju), this year’s theme of “Cooperation and Win-Win in Asia Cruise Industry” continues the forum’s objective of achieving mutual prosperity through collaboration among industry partners and related organizations. According to a report recently released by Cruise Lines International Association (CLIA), Asia is the fastest growing cruise market in the world. Owing to the international nature of cruise tourism, cooperation is vital in managing this growth in a sustainable manner and ensuring the mutual success of industry partners. The organizing committee plans to promote the signing of an MOU at the 5th Asia Cruise Forum JEJU to link up specialized cruise organizations that represent the cruise industry in Asia. Organizations include the Asia Cruise Leaders Network (ACLN), Asia Cruise Terminal Association (ACTA), CLIA North Asia, and Asia Cruise Services Network (ACSN). The ACLN is a cooperative network of cruise industry leaders, academics, and policymakers. It was proposed in 2013 by the Jeju Special Self-Governing Province as part of the Jeju Declaration for the development of Asian cruise tourism. The network held its inaugural annual conference in 2014 and its members are currently made up of eight countries and 59 institutions. Members representing various entities of the industry share information and develop policy on regional cruise industry growth at the regular and irregular meetings. The ACTA, chaired by the Singapore Cruise Centre, was formed as a regional forum for cruise terminal operators to cooperate in terminal development, operations and management, and to raise awareness of its members’ facilities and services to attract international cruise liners to Asia. CLIA North Asia was established along with CLIA Southeast Asia in 2009 and has been chaired by the representative of Royal Caribbean Cruise China since its founding. It works with government and private enterprise to “address market needs, master trade distribution, create highly desirable itineraries and offer advice on ports and infrastructure”. The ACSN, established in 2009, is an alliance of 17 experienced cruise-handling companies in Asia. Each member is managed by local experts passionate about their products and has good connections with local government bodies and port authorities. Combining relevant experience and a strong presence in 17 Asian countries, ACSN offers professional and creative solutions for shore excursions, overland tour programs, passengers’ turnaround, as well as logistics services. Priding itself as being a hub of cruise networking and aiming to place Jeju at the center of the Asian cruise industry, the forum takes the network to another level by connecting these four specialized organizations and providing the platform for greater business exchange and networking opportunities. The forum opens with the ACLN Annual Meeting on Thursday, followed by the 4th Korean Cruise Council meeting, as well as the International Marine Tourism Seminar held on the same afternoon. Further sessions will look at diversification strategies, changing trends in the cruise market, cruise terminal business strategies, and building and boosting cruise networks. This year’s forum has been extended by one day meaning it will take place over four days. A field trip to the Seogwipo Cruise Port as well as individual tour time has also been added. Other programs include the Asia Cruise Tourism Seminar, Ship Supplies Business Meeting, Shipbuilding Equipment Business Meeting, and a Cruise Cabin Crew Job Fair. The Cruise Industry Exhibition, which will be open over the first three days, features exhibitions from cruise lines, tourism organizations, and shipbuilding companies, and maximizes interactions between buyers and sellers, as well as general visitors. 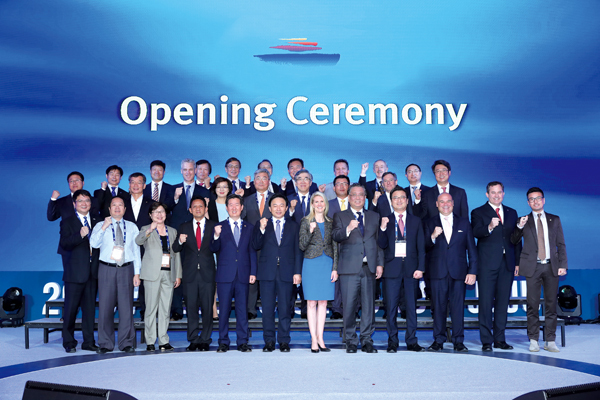 Hosted by the Jeju Special Self-Governing Province, the Ministry of Oceans and Fisheries, and organized by the Jeju Tourism Organization together with the Jeju Cruise Industry Association, 2017 Asia Cruise Forum JEJU’s 5th anniversary will be a milestone on the road towards win-win development in the Asian cruise industry.